Donald Baker, an engineer with the Los Angeles Department of Water and Power dreamed up the idea of shipping surplus northern water south and in 1964 took his idea to the Parsons Corporation where the North American Water and Power Alliance  (NAWAPA) was born. The idea was made immortal by Technocracy  and its dream of a united North American continent from the North Pole to Panama, which terrified Canadians as they envisioned their land of lakes going the way of the Aral Sea . The idea is kept alive today by Lyndon LaRouche and YouTube, although rumors abound that the scheme is being quietly built in dribs and drabs. The known facts are that while the Southern States and the Prairie Provinces are low on water, fresh water is wasted by draining north into the Arctic. The idea is to turn some of the water flowing north to the parched Southwestern states via the Rocky Mountain Trench which would be dammed. The downtown of Prince George, the northern capital of BC, would be submerged. The water would also flow east into the Canadian prairies to the Great Lakes and to the American industrial belt. The water and electricity from the dams would revive the America industrial heartland, industrialize BC, and make Alaska a transportation hub. Along with the reindustrialization of America there would be a revival of the railroads to move the goods produced. Honoring an election pledge not to sell BC Rail, Premier Campbell leased its Vancouver to Prince George Railroad to Canadian National for 999 years. CN subsequently combined with Burlington Northern Santa Fe Corp to form North America’s largest railroad company. The old BC Rail which terminated at Prince George is extending north to the Bering Strait on its way to London England. It is an old idea which the New York Times first reported on August 2, 1906. The then czar authorized the American syndicate led by Baron Loicq de Lobel to build a railroad from Siberia to Alaska by bridging and tunneling the Bering Strait. The project never did get off the ground, but interest in it still turns up now and again, and with the completion of the Channel Tunnel and a bridge from Sicily to Europe, the prospect of a crossing at the Bering Sea certainly looks plausible. Canadian retirees can and do live up to seven months of the year in the dry Southwestern States so bringing some water with them is only fair. The Mexicans too, would appreciate some fresh water being added to the Colorado River, which I am told is almost dry by the time it reaches the sea. 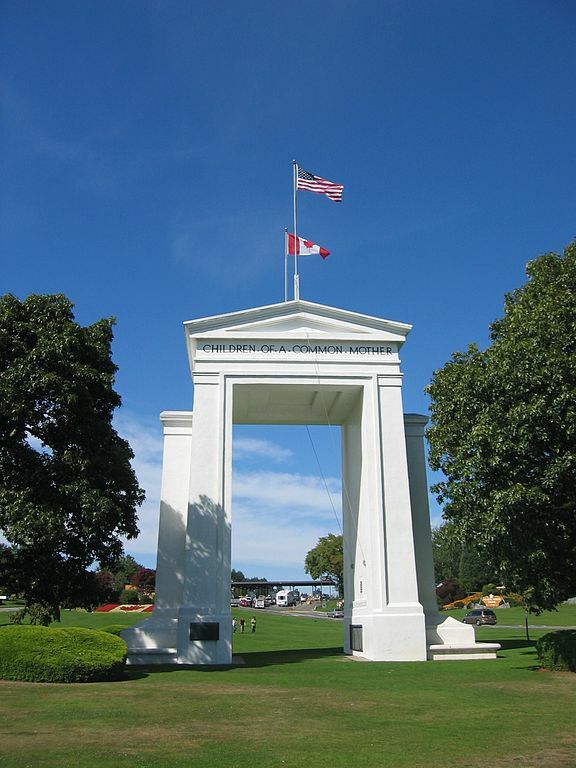 At Blaine, Washington on the US/Canadian border stands the Peace Arch , visible to all coming and going between our two countries. A large inscription on the American side reads, “Children of a common mother” while the inscription on the Canadian side reads, “Brethren dwelling together in unity.” Perhaps Canada could share a little water to hydrate its pensioners luxuriating under the hot southern sun and in turn the replenished California farmers could send food north to sustain the workers of Fortress North America?